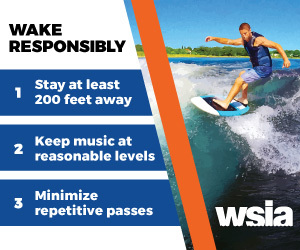 In an effort to proactively educate drivers on courteous boating behavior, the World Wake Association is currently promoting WSIA’s Wake Responsibly campaign to help minimize conflicts on waterways between homeowners and towed water sports participants. 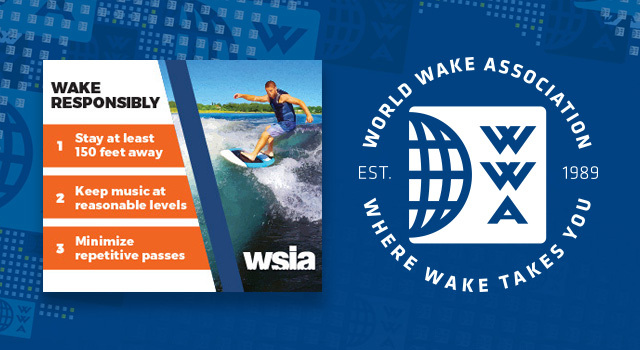 With an unmatched grassroots communication channel, including an e-mail list of all pro and amateur competitors over the past decade, the WSIA identified WWA as a necessary outlet to help spread the good word. In addition to e-news and social media support, the Wake Responsibly message is also being announced three times per day at ten major events across the country including the Nautique Wake Series and Malibu’s Evolution Pro Series and Rider Experience events. The Wake Responsibly initiative is part of the WSIA’s waterway protection efforts to minimize threats to lakes and rivers regarding towed water sports and to preserve the vitality of wake sports for years to come. The organization is focused on promoting and protecting all towed water sports through best practices, maintaining waterway access rights, educating participants, promoting safety and facilitating sustainable industry growth.